*Corresponding author: Y. Zheng and M. Wang, Key Laboratory of Industrial Fermentation Microbiology, Ministry of Education, College of Biotechnology, Tianjin University of Science and Technology, Tianjin, China; e-mail: yuzheng@tust.edu.cn and minw@tust.edu.cn. The expiration date of biopesticidal products is an essential feature of their use and storage. In the present work, the expiration date of biocontrol agent was predicted using the accelerated aging method. The available bacteria in Bacillus subtilis B579 biocontrol agent were 3.7 ±0.2 × 1011 CFU/g. It is calculated that the expiration date of the agent was about 17 months at 25°C. During this period, the available bacteria retained more than 90% of the value in the initial product. Thus, this work suggests the expiration date of biocontrol agents composed with spores could be estimated using the accelerated aging method. Plant diseases caused by soil-borne pathogenic fungus, such as Fusarium and Pythium, affect vegetables and crops growth and yield worldwide, and even result in significant economic loss (Noble and Coventry, 2005; Asad et al., 2014). A synthetic chemical fungicide has long been used for reducing the incidence of soil-borne plant diseases. However, it causes soil, water and air pollution, and is harmful to the health of people (Pieters and Vlietinck, 2005). With increasing attention to environmental protection and the increasing market demand for organic products, biological control exhibits excellent performance (Brannen and Kenney, 1997; Zheng et al., 2013). Some antagonistic microorganisms, such as Bacillus, Pseudomonadaceae, Agrobacterium and Pasteurella, can produce antimicrobial compounds which have been proved to be quite effective in controlling various plant diseases (Shrestha et al., 2014). Among them, Bacillus subtilis is one of the most effective microbes in controlling plant diseases (Nagórska et al., 2007). It has been reported that B. subtilis can not only inhibit the growth of pathogenic fungi by producing various lytic enzymes and antibiotics, but also induce systemic plant resistance by increasing the activities of several enzymes related to plant defense (Baysal et al., 2008; Choudhary and Johri, 2009; Santoyo et al., 2012). Furthermore, it is easy to cultivate and stabilize in the environment by forming spores (Lalloo et al., 2009). These characteristics provide B. subtilis with potential advantages over the other antagonistic microorganisms in the production and preservation of biocontrol agents (Chen et al., 2010b; Nagórska et al., 2007). It must be recognized that the efficacy of biocontrol agent prepared with antagonistic bacteria largely depends on the count of viable bacteria. One of the persistent challenges is assuring acceptable stability in the development of a biocontrol agent. The allowable level of loss of viable bacteria in biocontrol agent should be generally less than 10%. In our previous work, a biocontrol bacterium, B. subtilis B579, which exhibited obvious growth inhibition effect against pathogens, Rhizoctonia solani, Fusarium gramirum, Fusarium solani, Fusarium oxysporum and Phytophthora capsici, was obtained (Chen et al., 2010a; Chen et al., 2013). In the present study, the relation of viable bacteria to the storage period and temperature of biocontrol agent of B. subtilis B579 was calculated using the accelerated aging method. The strain B. subtilis B579 was maintained on a slant of LB agar medium at 4°C. Seed medium was comprised of (g/l) peptone 10, glucose 5, yeast extract 5, beef extract 5 and NaCl 5 (pH 7.0). Fermentation medium used for batch cultivation was comprised of (g/l) yeast extract 6, soluble starch 11, glucose 6, soy bean meal 13.9, beef extract 8.9 and maize meal 12.6 (pH 7.0). The seed culture was performed in a 250 ml Erlenmeyer flask containing 30 ml of seed medium at 37°C and 180 rpm for 12 h. A 7 l bioreactor (Baoxing Biotech Ltd, Shanghai, China) with a working volume of 5 l was used for B. subtilis B579 batch fermentation with 5% inoculums volume from seed culture. Cultivation temperature, aeration rate and the agitation rate were maintained at 37°C, 2 l/min and 500 rpm, respectively. The pH was adjusted with 1 mol/l NaOH when required. The fermentation was stopped after 26 h cultivation, and the fermentation broth with a cell concentration of 1.1 ±0.1 × 1010 CFU/ml was obtained. The sporulation ratio was about 90%, which is the ratio of spores to the total cell concentration measured according to Chen et al. (2010b). The fermentation broth was treated by centrifugation at 8000 × g for 20 min. The cell pellet was washed with deionized water, and then resuspended in 2 l deionized water. The dextrin, sucrose and sodium glutamate were added as thermal protectants to the concentrations of 12.5 g/l, 12.2 g/l and 3.7 g/l, respectively. Diatomite (particle size 20-60 μm) was added to 10.0 g/l as the carrier. The biocontrol agent of B. subtilis B579 was prepared by spray drying with entrance temperature of 120°C, outlet temperature of 70°C, pump rate of 60 ml/min and the atomization controlled at an air pressure of 0.1 MPa. For assaying the concentration of available cells, 100 μl of an appropriate dilution of biocontrol agent was spread on solid LB media with 3 replicates, and then the colony forming units were counted. The viable cell count of the agent was 3.7 ±0.2 × 1011 CFU/g. The cylinder-plate method was used to verify the inhibitory effect of biocontrol agent against F. oxysporum (Nagórska et al., 2007). The pathogen was incubated in the centre of PDA plates at 28°C for 2 days. Then, 200 μl of fermentation broth, biocontrol agent, negative solution (agent without B. subtilis B579) or sterile deionized water was added into the oxford cup. The concentrations of biocontrol agent and negative solution were 1 g/l. The fermentation broth was diluted to 3.7 ×1011 CFU/l which was the same as that of biocontrol agent solution. After 2 days incubation at 28°C, their inhibition effects were compared. The antagonism of biocontrol agent (1 g/l) against F. oxysporum was determined on PDA plates using the dual plate assay method (Tang et al., 2010). Sterile deionized water served as a control. Fungal radial growth was measured with vernier calliper. The fungitoxicity was recorded in terms of percentage growth inhibition which was determined as [(Dc – Dt)/Dc] × 100%. Where Dc was the average increased diameter of the fungal colony in control, and Dt was the average increased diameter of the fungal colony in treatment (Amini et al., 2010). Three replications were carried out for each treatment. The expiration date of the biocontrol agent of B. subtilis B579 was predicted by the accelerated aging method (Waterman and Adami, 2005). The expiration date was defined as the time when the survival cell number of the agent was 90% of the initial cell number. The inactivity of B. subtilis B579 cells follows the first order kinetics process. Under certain temperature, the equation can be represented as the equation (1). N0 is the initial cell concentration of agent, and Nt is the concentration of survived cells at time t. kT is the rate constant under the temperature T. The accelerated test was conducted at temperatures of 50°C, 60°C, 70°C, 80°C and 90°C. At each temperature, the survived cell number was detected at 0 day, 1 day, 2 day, 3 day, 4 day, 5 day, and 6 day, respectively. The kT at each temperature could be obtained based on the linear regression between log Nt and t.
Arrhenius exponential law is the theory evidence of accelerated aging test, of which the logarithmic form can be expressed as equation (2). Where, kT is the rate constant calculated from equation (1) at temperature T, Ea stands the activity energy, and R is gas constant. A regression equation could be obtained based on the linear relation between log kT and 1/T. For example, the k25, the rate constant at 25°C, could be calculated from log k25. Thus, the period for 10 % cell inactivity of the agent at 25°C could be calculated according to the equation (1), namely, the expiration date of the biocontrol agent. As shown in Fig. 1, the inhibition zones of biocontrol agent, fermentation broth, negative solution and sterile deionized water were 10.0 ±0.7 mm, 11.3 ±0.6 mm, 0.5 ±0.1 mm and 0 mm (no inhibition), respectively. The negative solution which was used for agent preparation showed little inhibitory effect on F. oxysporum. The inhibition zone of biocontrol agent was a little less than that of fermentation broth because some lytic enzymes such as chitinase and β-1, 3-glucanase were produced during the fermentation (Chen et al., 2010a). This result indicated that the B579 biocontrol agent could effectively inhibit the growth of plant pathogen F. oxysporum. The inhibition effect of 72.4 ±4.2% against F. oxysporum was obtained at 1 g/l of the biocontrol agent. Fig. 1. Comparison of the inhibitory effect. 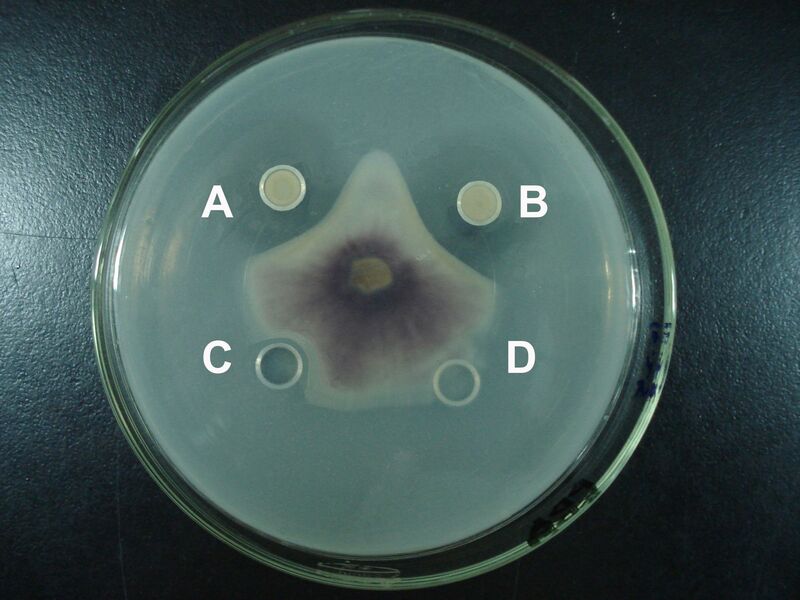 A – biocontrol agent of B. subtilis B579 (1 g l-1, 3.7 × 1011 CFU l-1); B – fermentation broth of B579 (diluted to 3.7 × 1011 CFU l-1); C – negative solution (1 g l-1); D – sterile deionized water. Temperature is one of important factors determining the survival of B. subtilis B579 in the agent. In this study, temperatures were set as 50°C, 60°C, 70°C, 80°C and 90°C, separately, to investigate the expiration date of biocontrol agent using the accelerated aging method. The number of survival cells in the agent at variable temperatures was detected, and the results are listed in Table I. The inactivity rate of cells in the agent increased with the increase of temperature. 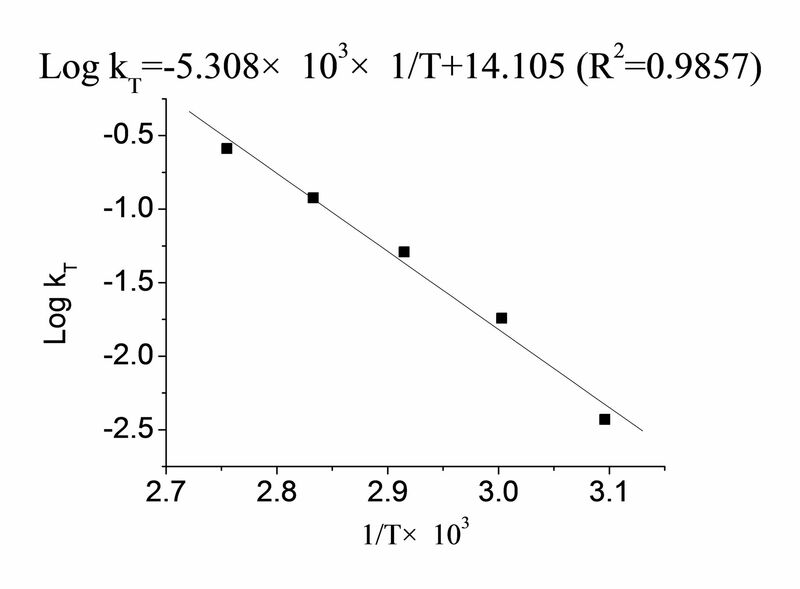 The regression equation under different temperature conditions was obtained as shown in Fig. 2. The rate constant at temperature 25°C, K25, was calculated as 2.042 × 10-4 d-1. Therefore, t0.9, i.e. the time when the number of surviving cells was 90% of the initial agent, was calculated as 514 d according to the equation (1). The expiration date of the B. subtilis B579 biocontrol agent was predicted as 17 months at 25°C. The accelerated aging method is usually used for predicting the expiration date of drugs in a relatively short time (Waterman and Adami, 2005). To our knowledge, few studies have been reported on the expiration date prediction of biocontrol agent prepared with antagonistic bacterial cells. Commonly, the inactivity of bacteria cells is different from that of chemical drugs because most bacteria are sensitive to heat. However, spores of B. subtilis are heat resistant, and are in a state of metabolic dormancy (Setlow, 1994). Luckily, the inactivity of agent containing B. subtilis B579 spores follows the first order kinetics process. The R2 of regression equation under 50°C, 60°C, 70°C, 80°C and 90°C was 0.9811, 0.9913, 0.9847, 0.9768 and 0.9733, respectively. Thus, the inactivity kinetics of biocontrol agent prepared with spores could be analyzed using Arrhenius equation. The present work suggests that the expiration date of biocontrol agent prepared with spores of antagonistic bacteria could be predicted with the accelerated aging method which is effective and timesaving. Nevertheless, additional work is required, since the inhibition effect of fermentation broth against F. oxysporum was a little more than that of biocontrol agent with the same cell number. Besides chitinase and β-1, 3-glucanase, some antibiotics (Iturin A and Surfactin) that were thermal stable were identified from fermentation broth of B. subtilis B579 by the method of HPLC-MS (date not shown). Therefore, a more efficient biocontrol agent, containing antibiotics that are produced during the fermentation, might be obtained by spray drying of fermentation broth. This work was fund by the Natural Science Foundation of Tianjin, China under Grant 09JCZDJC19100 and 13JCQNJC10000. Amini J. and D. Sidovich. 2010. The effects of fungicides on Fusarium oxysporum f. sp. Lycopersici associated with Fusarium wilt of tomato. J. Plant Prot. Re. 50:172-178. Asad S.A., N. Ali, A. Hameed, S.A. Khan, R. Ahmad, M. Bilal, M. Shahzad and A. Tabassum. 2014. Biocontrol efficacy of different isolates of Trichoderma against soil borne pathogen Rhizoctonia solani. Pol. J. Microbiol. 63:95-103. Baysal Ö., M. Caliskan and Ö. Yesilova. 2008. An inhibitory effect of a new Bacillus subtilis strain (EU07) against Fusarium oxysporum f. sp. radicis-lycopersici. Physiol. Mol. Plant Pathol. 73:25-32. Brannen P. and D. Kenney. 1997. Kodiak – a successful biological-control product for suppression of soil-borne plant pathogens of cotton. J. Ind. Microbiol. Biotechnol. 19:169-171. Chen F., M. Wang, Y. Zheng, J.M. Luo, X.R. Yang, and X.L. Wang. 2010a. Quantitative changes of plant defense enzymes and phytohormone in biocontrol of cucumber Fusarium wilt by Bacillus subtilis B579. World J. Microbiol. Biotechnol. 26:675-684. Chen Z. M., Q. Li, H.M. Liu, N. Yu, T.J. Xie, M.Y. Yang, P. Shen and S.D. Chen. 2010b. Greater enhancement of Bacillus subtilis spore yields in submerged cultures by optimization of medium composition through statistical experimental designs. Appl. Microbiol. Biotechnol. 85:1353-1360. Chen F., M. Wang, Y. Zheng, S.J. Li, H.Z. Wang, D.D. Han and S.J. Guo. 2013. The effect of biocontrol bacteria on rhizosphere bacterial communities analyzed by plating and PCR-DGGE. Curr. Microbiol. 67:177-182. Choudhary D.K. and B.N. Johri. 2009. Interactions of Bacillus spp. and plants – with special reference to induced systemic resistance (ISR). Microbiol. Res. 164:493-513. Lalloo R., D. Maharajh, J. Gorgens, N. Gardiner and J. Gorgens. 2009. High-density spore production of a B. cereus aquaculture biological agent by nutrient supplementation. Appl. Microbiol. Biotechnol. 83:59–66. Nagórska K., M. Bikowski and M. Obuchowskji. 2007. Multicellular behaviour and production of a wide variety of toxic substances support usage of Bacillus subtilis as a powerful biocontrol agent. Acta Biochim. Pol. 54:495-508. Noble R. and E. Coventry. 2005. Suppression of soil-borne plant diseases with composts: a review. Biocontrol Sci. Techn. 15:3-20. Pieters L. and A. Vlietinck. 2005. Bioguided isolation of pharmacologically active plant components, still a valuable strategy for the finding of new lead compounds? J. Ethnopharmacol. 100:57-60. Santoyo G., M.D.C. Orozco-Mosqueda and M. Govindappa. 2012. Mechanisms of biocontrol and plant growth-promoting activity in soil bacterial species of Bacillus and Pseudomonas: a review. Biocontrol Sci. Techn. 22:855-872. Setlow P. 1994. Mechanisms which contribute to the long-term survival of spores of Bacillus species. J. Appl. Bacteriol. 76:49-60. Shrestha A., B.S. Kim and D.H. Park. 2014. Biological control of bacterial spot disease and plant growth-promoting effects of lactic acid bacteria on pepper. Biocontrol Sci. Techn. 24:763-779. Tang J., X.J. Meng, H. Liu, L.J. Zhao, L.G. Zhou, M.H. Qiu, X.M. Zhang, Z. Yu and F.Y. Yang. 2010. Antimicrobial activity of sphingolipids isolated from the stems of cucumber (Cucumis sativus L.). Molecules 15:9289-9297. Waterman K. and R. Adami. 2005. Accelerated aging: prediction of chemical stability of pharmaceuticals. Int. J. Pharm. 293:101-125. Zheng Y., F. Chen and M. Wang. 2013. Use of Bacillus-based biocontrol agents for promoting plant growth and health, pp. 243-258. In: Maheshwari D.K. (ed.) Bacteria in agrobiology: disease management. Springer Berlin Heidelberg.